After getting engaged, it’s normal to dream up big plans for your wedding. Most people see it as the most important day of their lives. Finding a dress, choosing your wedding party and walking down the aisle are just a few magical things to look forward to as a bride. But with all of those beautiful ideas comes hard work too. For some, planning a wedding can easily turn into the most stressful time of a relationship. The romantic relationship, as well as the relationships between friends and family, can alter dramatically in the wedding season. All of the bridesmaids might not be able to agree on a dress, or the venue might not be able to hold the massive guest list that was invited. But all of these issues are nothing compared to the number one cause of stress when planning a wedding: money. That’s why a woman, known only as Susan, decided to ask all of her guests to donate $1,500 so that she could afford her dream wedding. After months of saving, she and her fiancé were able to come up with $15,000 of their own for their wedding. The average cost of a wedding in America is around $30,000. For their dream wedding, they would have to quadruple their own money and double the average wedding price to come up with a grand total of $60,000. 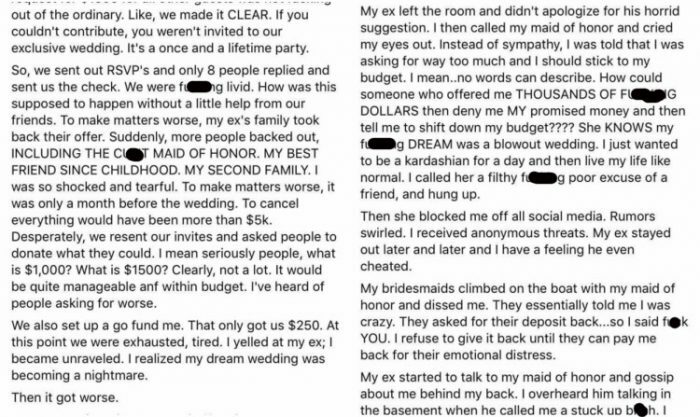 Apparently, this bride had a slight obsession with the Kardashian family and wanted to live like them for just one day. 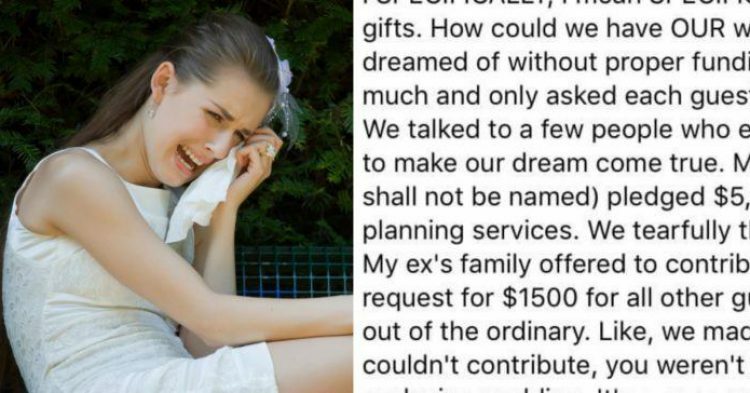 This whole plan didn’t fare well with the guests, and after sending out invitations, she only received 8 responses from people who were willing to fork up the cash to afford this event. Not soon after, other people in the party started to voice concerns about the bride’s demanding ways. The groom himself offered to get married in Las Vegas as an alternative to the fiasco that was becoming their big day. That didn’t end well. And how do we know all this? Why Facebook of course. 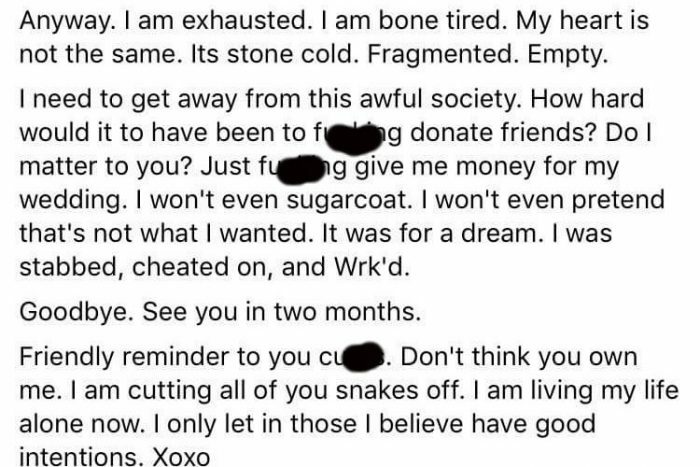 The bride decided to post a pretty lengthy rant on Facebook, telling her side of the story and questionably sounding like the most out of touch person in the world. You’re not going to believe what she had to say. As more and more people started pulling out, a GO FUND ME page was created as a last-ditch effort to raise the money needed for the wedding. It mustered up and measly $250, which was the last straw and four days before the wedding they were forced to cancel. After cancelling the wedding, breaking up with her fiancé and losing most of her friends, the bride decided to escape for two months on a solo backpacking trip to South America. Unbelievable. Why would someone be willing to lose so much over something that doesn’t matter without them? Do you know of any bridezillas that can compare to this one? How would you deal with this situation if you were a bridesmaid?